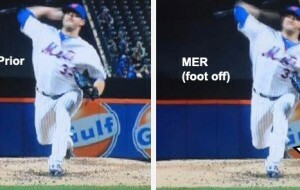 Last night on MetsBlog Talk Radio, Minaya did let us know that he’s always thinking about trades — in fact even getting advice from his wife — but that they are hard to do for several reasons. And as Matt Cerrone pointed out, he’s hammered with the question of “who are you after” all the time. The standard answer is, “we’re always looking for pitching”, and he’ll NEVER name names because that goes against MLB policy and regulations (if he even mentions he has an interest in a player on another team, he’s subject to a hefty fine). That said, all we can do is speculate. The rumors swirling include Mark Buehrle, Shawn Chacon, Damaso Marte, Brad Lidge, Scott Williamson, and just about every other arm on a team fading from the playoff picture. On the block, supposedly, are Jermaine Dye, Mark Teixeira, Todd Helton, and a few other big names. However, it’s doubtful the Mets will land a big name, for several reasons. First of all, the big problem with the Mets making a move for a position player is this: who do you replace? While it would be nice to see a guy like Helton at first base, Carlos Delgado is immovable in more ways than one — besides the fact his feet are like cinderblocks, his $14.5M per year contract and .220 batting average make him less than attractive to possible suitors. There also seems to be some kind of a magnetic aura that keeps him around, and in the middle of the order — the same mysterious force that has kept Julio Franco on the roster, Damion Easley in the lineup, and Ricky Ledee around the clubhouse. Obviously, David Wright, Jose Reyes, and Carlos Beltran are going nowhere, and neither is Paul LoDuca nor Jose Valentin. Some fans might like to see Shawn Green dealt, but right now the outfield depth is shaky, and are you really going to find someone better — without giving up your top prospects? The only real opening is in leftfield, and how long that remains is uncertain. Moises Alou may be back in a week, or a month, or in March — no one seems clear. Endy Chavez should be back in a few weeks, and if both he and Alou return simultaneously, and a guy like Jermaine Dye is on the roster, there will be a serious logjam in the outfield. In the past, the Mets have made deals that no one saw coming (other than, perhaps, the Shawn Green trade, which had been rumored since 1996). For example, not one pundit thought Xavier Nady would be dealt away, and the El Duque deal materialized out of thin air. So, the more you hear about the Buehrle-Dye deal, the less likely it will become reality. Most likely, Minaya will find someone off the scrap heap — kind of like what he did in acquiring Dave Williams and Guillermo Mota last year. That would make the most sense, considering the current roster and the impending return of Alou and Chavez. Expect Omar to find a potential fourth outfielder / first baseman who can fill the gap right now, but not be in the way should Alou return. That’s not too tall an order. Looking around MLB, there are a few guys who might fit that description. For example: Jacques Jones (Cubs), Eric Hinske (Red Sox), Kevin Millar (Orioles), Matt Stairs (Blue Jays), and Jeff Conine (Reds). Yes, I’ve seen that the Mets were scouting Randy Winn of the Giants, but don’t see him as a good fit — unless Shawn Green is part of the deal. Winn is an everyday player, and not that much different from Chavez — except that he’s getting older and slowing down. Watching Minaya’s past history, it would be more in line for Omar to get a Conine type — in other words, a veteran bat that can add a bit of punch for the short-term, will accept a bench role when Alou returns, and will come cheap. If the Mets bats continue to flounder, we’ll likely see some kind of a deal sooner rather than later. Next What’s Going on with the Cyclones? Hokay, Joe . . . I’ve advocated a solution that would bring back one of the most beloved Mets (over the last three years, anyway) back to Shea, for the rest of the year, anyway, and add a veteran presence in the clubhouse. Jon Adkins to the Cubs for Cliff Floyd. Pick up a sizable amount of Cliff’s contract, and it just might come off. Hmmm … not a bad idea, though I’m not sure the Cubs want Adkins. I think as long as the Cubs believe they have a shot at the postseason, they’ll want an MLB veteran in return — someone to help down the stretch. How about Schoeneweis ??? !!! !